Escape from the city and travel into the interiors of Rishikesh for an exciting session of river rafting and camping. On this trip to Rishikesh, you’ll embark on a thrilling session of river rafting over the Ganges and battle rapids rated grade II and III. Alongside rafting on quirkily rapids like Three Blind Mice, Roller Coaster, Cross fire among many other, you'll jump into the Ganges to try body surfing, swimming and cliff jumping. With delightful views of the mountains around Rishikesh, you'll stay at a serene campsite where you can try your hand at volleyball or badminton, trek through the lush greenery and gather around a bonfire at night. With wonderful views of mountains and waterfalls, your campsite radiates a calm and peaceful ambiance. Alongside rows of tents to accommodate happy campers, your campsite is also built to offer views of mountain sides layered with forests of pine trees. Another highlight of your trip, the rafting session will take you over a 12-km stretch of the Ganga River. Flanked by tall trees and lofty mountains on both sides, your rafting route will showcase the mighty waves of the holy Ganges and the natural beauty of Rishikesh. 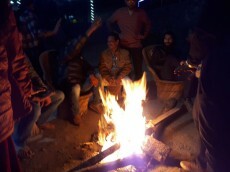 • Embark on this 2-day camping and rafting trip in Rishikesh. • Face the rapids of the Ganges rated grades II and III for 12-kms. • Explore the undisturbed beauty of a picturesque campsite. Travellers are required to adhere to the instructions of the rafting instructor while rafting in Rishikesh. 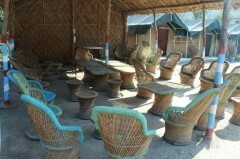 For cancellations made 8 or more days before departure of the Rishikesh rafting trip: 100% refund. For cancellations made less than 8 days before departure of the Rishikesh rafting trip: No refund. The check-in time for the campsite is flexible, check-out time is at 11:00 hrs. Activities and arrangements during the Rishikesh rafting trip are subject to availability, weather conditions and other unforeseen circumstances that may result in alterations or omissions. Arrive at the campsite by morning for a full day of fun. You'll check into your luxury tents and take a walk around the campsite to explore the surrounding trees and greenery. After a delicious lunch, you can engage your friends or family in a lively game of volleyball or badminton. Since the campsite is within trekking distance of a waterfall, you also venture out and hike to the waterfall. 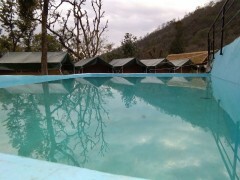 If you don't feel like trekking all the way, the campsite is also equipped with a swimming pool that you can take a dip in. In the evening, you'll gather around a bonfire with light music. 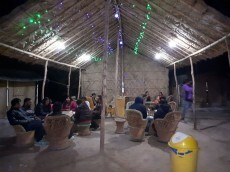 After an hour or so of fun with your fellow campers, you'll have dinner or even embark on a night trek near the campsite, before retreating back into your tents. 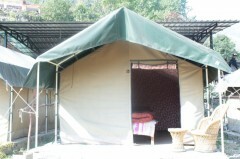 Overnight in Rishikesh campsite in tents. After an early breakfast with hot tea, you'll check out of the campsite and head out for a thrilling session of rafting from Marine Drive to Shivpuri. This stretch covers 12 kms and includes grade II and III rapids named Three Blind Mice, Black Money among many others. 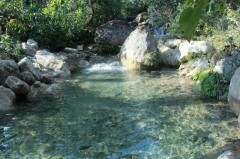 You can also enjoy fun river activities like cliff jumping or body surfing. After enjoying a rejuvenating session of rafting, you can change into dry clothes. Your trip ends here. 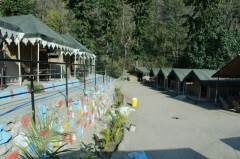 Overnight at Rishikesh campsite in tents. The check-in time for the campsite is flexible, allowing you to check-in at your convenience. Today's meal package includes lunch and dinner. 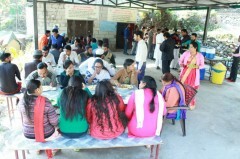 Meals will be served in a buffet style with one non-veg dish served during dinner. You'll also be snacks and tea in the evening. You'll be accommodated in luxury tents on a triple-sharing basis that are well-furnished with beds, pillows, bed sheets and attached washrooms. Today's meal package includes breakfast before you check-out and go rafting. The check-out time at the campsite is 11:00 hrs. Rishikesh is well-connected to most major cities of the country via flights to Dehradun's Jolly Grant Airport or trains to the Rishikesh railway station. You can take local transport to reach the campsite, located 1-hr drive from the airport, 30-min drive from the railway station.